As part of the Thirty Plus initiative of which I am a member, a few weeks ago I was invited to dinner with Marina Shcherbinina the founder of the Bio Extracts brand. A brand up until this dinner I had never heard of or come across, but the introduction I was sent by email intrigued me. In short Bio Extracts use the latest biotechnology to develop creams and boosters for you to combine at home - pretty much giving you the chance to make your own skincare, after all no one quite knows your skin as well as you do. Marina was incredibly passionate about her brand and what stood out during her presentation is what she is not only dedicated to making each product the very best that it can be but she will not cut any corners when it comes to the ingredients or quality. It is through using highly purified ingredients derived from plant extracts that skincare benefits are delivered in this unique skincare brand. There are two elements to the Bio-Extracts system - Creams and Boosters, pretty straightforward and relatively easy to get to grips with. The Bio-Extract Creams use what is called a Multi-Lamellar System which is explained as follows "the Multi-Lamellar System has a very distinct structural similarity to these natural layers in the skin and mimics the skin’s own lamellar structure. It is designed to act like a “patch” on the skin, restoring its barrier function thus preventing trans-epidermal water-loss (TEWL), improving hydration and protecting the skin from external irritants. Now for someone who isn't techy I get this. Then come the Bio-Extracts Boosters and they use a phospholipids-based delivery system to ensure actives penetrate deeper into the skin layers. Again it is explained that Phospholipids are essential constituents of the cellular membranes of all living organisms and they regulate cell life. Bringing those boosters and the creams together you have the opportunity to create your own skincare product for whichever skincare concern you might. The cream comes in an airless jar and the booster are contained in syringes. What I like about this is that the airless jar of cream dispenses a precise amount of moisturiser each time with just one pump and although you can use it on its own, the combination of using the syringes allows you the chance to address one or more concerns. Light Cream - This is an oil absorbing, mattifying moisturiser with uplifting scents to help people with combination, oily or problem skin. What I like about this cream is that it does absorb excess oil and does mattify the skin, something which if like me you have combination/oily skin the oil slick shine can often be an issue, so it is nice to use a product which helps to deal with it. Antioxidant Boost – contains a powerful combination of fruit extract, minerals and flavonoids to counteract the damaging effects of oxidative stress. Rutin and Rosmarinic acid help in scavenging free radicals, while manganese, zinc and selenium support the antioxidative defence enzymes. Hydro Boost – The Hydro Boost will enhance skin radiance and give a firmer, plumped up appearance to the skin. It also gives intense hydration with botanical Hyaluronic Acid to help reduce the appearance of fine lines and wrinkles and to prevent further signs of premature ageing. Redness Relief Boost - helps to strengthen the skin’s natural barrier integrity, improving the ability of the skin to act as a physical and mechanical barrier against external factors. The bio-extract from the bark of White Wallaba, a tree that grows in the Guyanese rain forests, is a true botanical powerhouse. High in tannins, the bark and resin contain anti-inflammatory properties and have been used traditionally by local people for wound healing, toothache or ease of joint pains. White Wallaba bio- extract immediately helps to visually neutralise skin redness and restore skin clarity. Now that I have my cream and boosters, which I have used up, I liked being able to create and tailor my own skincare in so much that I could decide how much of the booster I felt my skin needed and if you’re thinking that this might be a skin care system that you want to try for yourself then the sets that you can buy that come with a cream and 2, 3 or 4 boosters and you can choose per issue that you have and there are even sample sets for just £5! This brand is vegan, paraben free, non GMO, British made, not tested on animals and all ingredients are natural. 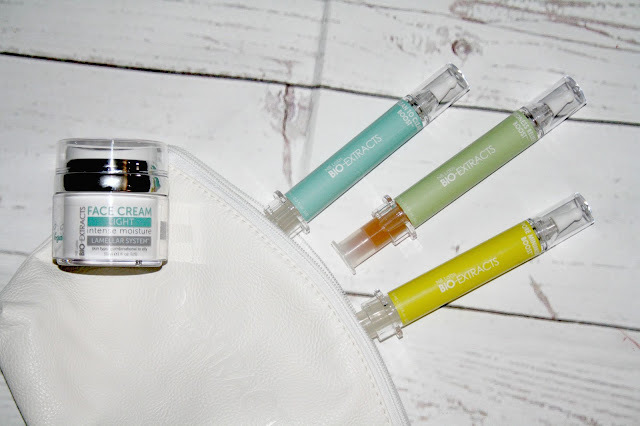 I love the idea of adding boosters to your skincare in order to tailer it to your needs. I'm surprised more brands don't have products like this. I love how you can tailor these products to your own needs!! Def need to check this brand out! I love how unique this is! It is great you can make it to your skins needs. It sounds like a brilliant idea - after all, who knows your skin the best! I adore this range and Marina is such a wonderfully passionate women! This is such an interesting concept, and it makes so much sense to be able to customise your skincare to suit you! This sounds so good! I love the idea of tailoring your skincare to meet your needs.